Traveling alone may be the single best catalyst for personal growth. My solo traveling experiences have created quantum leaps in various areas of my life. And every person I’ve met who has traveled alone has been among the most interesting and awesome people I’ve encountered. It may sound paradoxical, but the more you explore the world outside, the more you explore the world within. Solo travel gives you free rein for the exploration of both the external and internal world. Sure, it can be lonely at times, but you meet a lot of people and get to know yourself when there aren’t familiar faces always around. And yes, it’s hard leaving your friends and family behind for any period of time. But it’s completely worth it and you will come back a better person. You learn to be independent, do things on your own, problem solve for yourself, navigate on your own and become your own best friend. Self-sufficiency is an invaluable byproduct of solo travel. When traveling alone, you’re forced to talk to more people (unless you just want to be by yourself 24/7, which would drive anyone insane). I’ve gone out alone plenty of times and I always end up meeting more people than if I went out with a group of friends. Why? If you go to a bar alone, for example, you’re not just going to stand in the corner by yourself. It forces you to leave your comfort zone and talk to anyone near you (which leads to the next reason). Because you meet so many people when traveling alone, you naturally enhance your conversation skills. There is no one else who you can depend on to carry a conversation; it’s all on you. So naturally, you get better at starting conversations and less hesitant about approaching people. During solo travel, you’re almost never in your comfort zone. You get used to the excitement, the adventure and the bold decisions. Though you’ll undoubtedly face inner resistance, push through it. This is where the magic happens. Life begins at the end of your comfort zone. Growth only happens when you push your boundaries. This is a big reason why traveling alone spurs so much personal growth. You are in complete control of everything you do during solo travel. If you want to do something, there’s no one else to consult with and no consensus to be made. You just do it. Traveling alone gives you ultimate flexibility, a high degree of freedom and the opportunity to be as spontaneous as you wish. This is most applicable to highly empathetic individuals, but still applies to everyone. When you travel alone, you have the rare opportunity to do whatever you want, whenever you want and spontaneously follow your own intuitive desires on a whim. 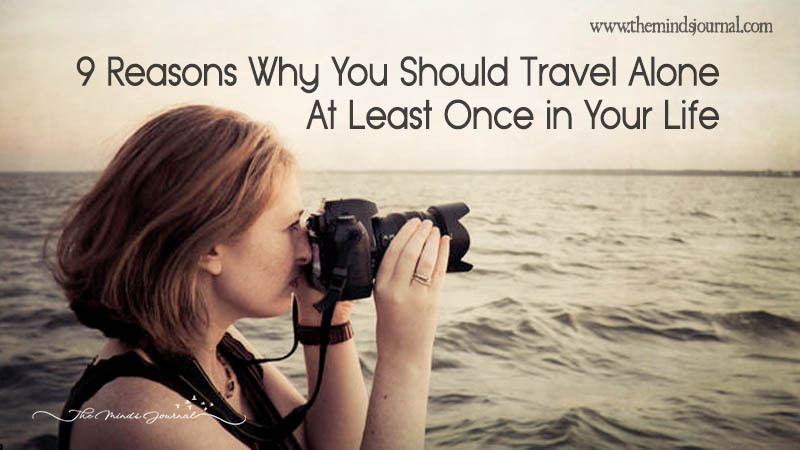 It also allows you to work on any personal projects or develop specific skills you desire while traveling. To use myself as an example, I get much more writing and blog work done when traveling alone compared to when I’m with other people. I did it and was great!! !